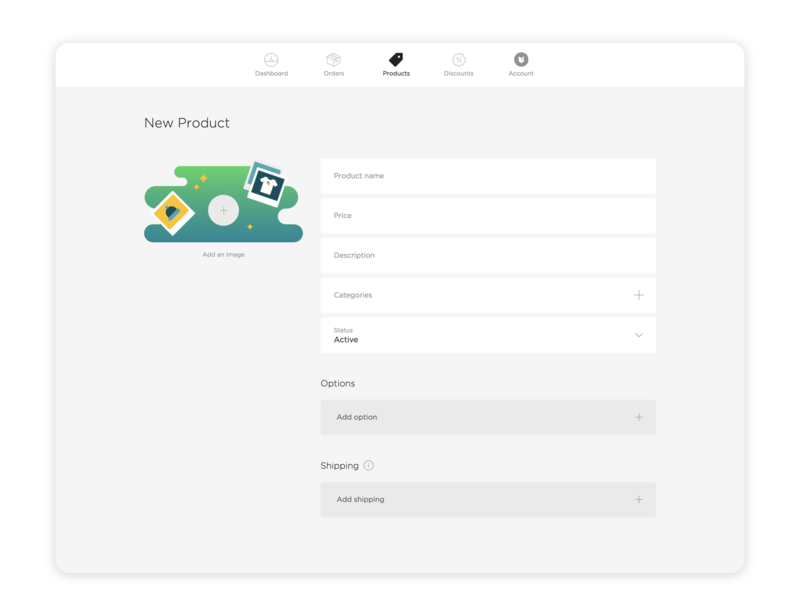 Adding new products to sell in your shop is a breeze - head to the Products area in your admin and click the Add product + button to get started. Upload your best shots here. Trust us, photo quality can make or break a product’s sales. When in doubt, natural light (no flash), sharp focus, and a blank backdrop are the way to go. Learn more in our DIY Product Photography guide. Work smarter! Uploading multiple product images at once saves time. If you’re on a mobile device, select your pics and upload. On a desktop, you’ll use the Shift + click shortcut. Give your product a brief, descriptive name that will connect with customers. How much are you selling your product for? Enter the price here, or if you offer variations with different price points, use the product options feature to add each option and its own price. If you’re not sure where to start, we’ve got some tips. Tell the world all about this product. Why should visitors buy it? What makes it unique? How about sizing, measurements, or other characteristics customers will want to know about? Remember, your goal is to write to sell. Sort products into their own categories here. Tees, prints, accessories, vinyl - whatever makes the most sense for your shop. Is this item ready to sell now? Make it Active. Not ready for the public? Keep it Hidden. None left in stock? Mark it Sold Out. Got something new to tease? Set it to Coming Soon. You’re welcome to sell preorder / pre-sale products if you’d like, though there’s not a built-in product status for it. Just make sure you add a note to your product descriptions so customers are aware the item is for preorder, and let them know when they can expect to receive it. Add an option for each variation you offer of a product, like size or color. You can even set different prices for options within a product. Got more than one set of options? You’ll need to create a separate product listing for that, or group together options in one list - Small / Green, Medium / Green, etc. Here’s where you’ll set shipping costs for the product. For the full 411, check out how to charge shipping for a product. You can copy an existing product to save yourself time creating new listings with similar attributes. Choose the action menu in any product in your admin, and then Copy product. Need to edit statuses, shipping costs, or categories for a bunch of products at once? Check out the bulk edit action menu to do it the fast, easy way. Click or tap the + icon in the top right corner to add a new product. Give your product a name, price (click the tag icon to mark it On Sale), description, and upload images. Add any product options, quantities if you are tracking inventory, shipping costs, or sort into categories. Give your product a name, price, description, and upload images.